I just finished teaching Mere Christianity to my Sunday School class. Actually, to be completely accurate, @mrskylarkk & I just finished teaching Mere Christianity to the High School Sunday School class. It was a phenomenal experience. It is one thing to read a book & enjoy it yourself, it is another thing entirely to use a book as a text for pedagogy. One must know the material better than their students. One must know the chapters and how they relate to other arguments. One must be prepared for everything. As a result, One learns more than he has in previous readings of the same book. That happened to me. C. S. Lewis, the author of this classic work, begins with a natural argument for morality--not Christianity, not even Deity. Slowly, the argument for an outside entity is built. Notice also that Christianity is in the majority throughout the first chapter. Christianity agrees with every religion (which well outnumbers atheists). In fact, Christians agree that there is one monotheistic God, and is still in the majority with Judaism & Islam. These things do not distinguish Christianity, these are things that are common to mankind. What distinguishes Christianity is the relationship that Mankind can have with their Creator. Since the Creator is outside of the Creation, He has an ultimate goal. That ultimate goal is reanimation--to make Mankind back into a perfect image of Himself. That is the mere goal of Christianity; the point, if you will. By looking at the human experience in this way, it makes sense that Man has no meaning as long as he strives against God's will. If the painting ran away from the artist, would it ever be a masterpiece? The answer is no, and the same applies to Man's spiritual state. Another thing to keep in mind with this piece of literature--& it should be treated as such, this is no self-help book--is its original presentation. 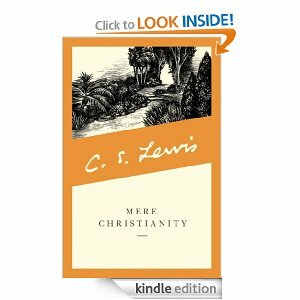 Remember that Mere Christianity was originally conceived as a series of radio segments aired after World War II while Lewis was at Oxford. Hence, the chapters are short and succinct. In addition, the chapters build and never get too heavy. Further, note that Lewis is struggling to keep a fair & balanced view of humanity in a time when absolute devils were seen in positions of power. How many people must have thought they were in the presence of the Antichrist? While Hitler & Mussolini were antichrists, they certainly were not the apocalyptic Antichrist of Dispensationalism. But that is another topic for another time. What is to be remembered is the state of the world at the time of these discussions.